With 33 floors, the V Hotel Dubai, Curio Collection by Hilton soars high above the bustling Sheikh Zayed Road and the Dubai Water Canal offering panoramic views of the Dubai Skyline. It features 2 restaurants, 1 lounge and 1 poolside bar and free WiFi throughout the property. 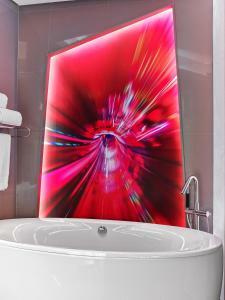 All rooms offer a future forward technology and entertainment. The rooms are spacious with comfortable seating areas and satellite flat screen TVs. The bathrooms are like nothing you've seen with the bathtub set in an open plan fashion. V Hotel Dubai offers plenty of choice to suit every palate. Check out NAMU, a destination restaurant that presents a stimulating Korean cuisine or stop by Level Seven, a culinary crossroads of the Mediterranean. Business & leisure bookers alike will enjoy use of the state-of-the-art Gym fitness centre which offers equipment for cardio, weights and yoga alike. With more than 1,000 square meters of event space and meeting rooms, V Hotel Dubai orchestrates fully adaptable conference equipment and world-class audiovisual facilities to set the stage for lively and spectacular presentations. the property also boasts a tennis academy on site with indoor and outdoor courts. Next door to V Hotel Dubai lies the spectacular water-themed show. Just minutes away from key attractions such as The Dubai Mall, Burj Khalifa and the business districts of Business Bay and DIFC, it provides easy access to major city landmarks. guests can jog by the canal or cycle in the 9 km Meydan professional cycling track which has direct access to the hotel. Complimentary valet parking is available for all guests. A free shuttle bus to Dubai Mall, private beach and business districts is available. Please inform V Hotel Dubai, Curio Collection by Hilton in advance of your expected arrival time. You can use the Special Requests box when booking, or contact the property directly with the contact details provided in your confirmation. Guests are required to show a photo identification and credit card upon check-in. Please note that all Special Requests are subject to availability and additional charges may apply. Featuring a modern bold design, this 44 sqm room offers a king size bed. It includes a fixed study desk, a bar counter, tea & coffee facilities. The open concept bathroom is fitted with a free standing bathtub, separate rain shower and Elemis bathroom amenities. Interconnecting rooms are available. Featuring a modern bold design, this 44 sqm room offers 2 queen size beds. It includes a fixed study desk, a bar counter, tea & coffee facilities. The open concept bathroom is fitted with a free standing bathtub, separate rain shower and Elemis bathroom amenities. Interconnecting rooms are available. 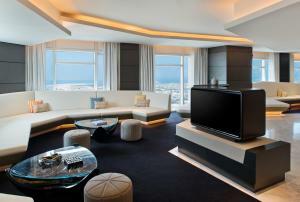 Featuring a modern bold design, this 44 sqm room offers views of Dubai water canal and the Arabian Gulf. It includes a king size bed, a fixed study desk, a bar counter, tea & coffee facilities. The open concept bathroom is fitted with a free standing bathtub, separate rain shower and Elemis bathroom amenities. Interconnecting rooms are available. 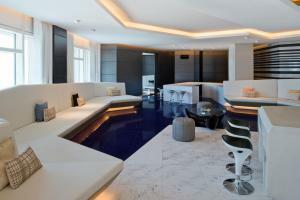 Featuring a modern bold design, this 44 sqm room offers views of Dubai water canal and the Arabian Gulf. It includes 2 queen size beds, a fixed study desk, a bar counter, tea & coffee facilities. The open concept bathroom is fitted with a free standing bathtub, separate rain shower and Elemis bathroom amenities. Interconnecting rooms are available. 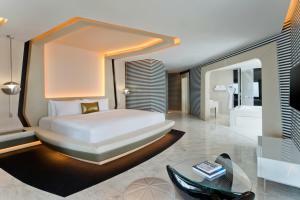 Featuring a modern bold design, this spacious 68 sqm room offers views of Dubai water canal and the Arabian Gulf. It includes a king size bed, a fixed study desk, a lounge area, a bar counter, tea & coffee facilities. The open concept bathroom is fitted with a free standing bathtub, separate rain shower and Elemis bathroom amenities. Interconnecting rooms are available. 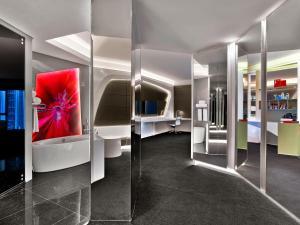 Featuring a modern futuristic design, this 86 sqm suite offers free WiFi. It includes a bedroom with a round bed, walk-in closet, a lounge area with a bar, tea & coffee facilities. 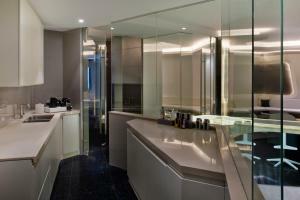 The en-suite bathroom is fitted with a circular bathtub, double vanity, a rain shower and Elemis bathroom amenities. Interconnecting rooms are available. 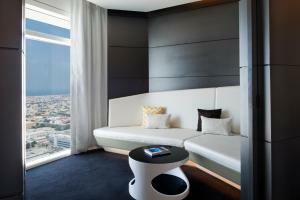 Featuring a modern bold design, this 156 sqm suite offers free WiFi. It includes a king bed, lounge and bar counter, tea & coffee facilities and an adjoining entertainment room. The open style bathroom is fitted with a bathtub, rain showers and Elemis bathroom amenities. 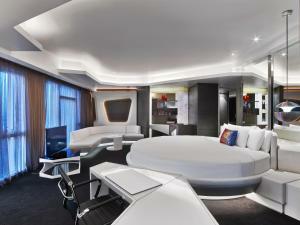 Featuring an open space concept with a modern bold design, this 117 sqm suite offers free WiFi. It includes a spacious bedroom with a round bed, lounge and bar area, tea & coffee facilities and a walk-in closet. The open style bathroom is fitted with a free standing bathtub, double vanity, rain showers and Elemis bathroom amenities. Interconnecting rooms are available. 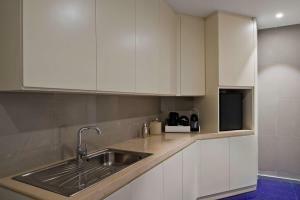 This spacious, 125 sqm suite offers free WiFi. It includes a separate bedroom area with a round bed, study desk, lounge area, tea & coffee facilities and a walk-in closet. The en-suite bathroom is fitted with a bathtub, double vanity and a rain shower. 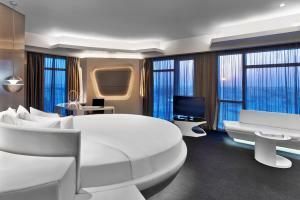 Featuring views of the Dubai water canal and the city, this 170 sqm suite offers free WiFi. It includes a cigar room, separate spacious bedroom with a king bed, living room, lounge and bar, kitchenette, tea & coffee facilities and walk-in wardrobes. 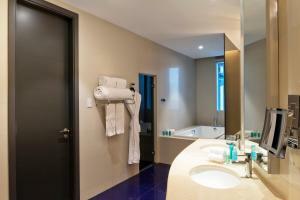 The en-suite bathroom is fitted with a free standing bathtub, double vanity, a rain shower and Elemis bathroom amenities. 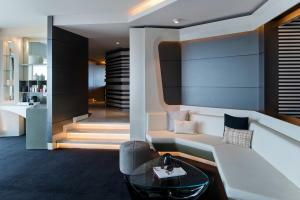 Featuring views of the Dubai water canal and the city, this 215 sqm suite offers free WiFi. It includes a separate spacious bedroom with a king bed, a spacious living room with a lounge, bar area and a dining area for 6 persons, a study desk, tea & coffee facilities and walk-in wardrobes. 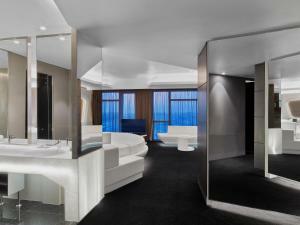 The en-suite bathroom is fitted with a free standing bathtub, double vanity, a rain shower and Elemis bathroom amenities. 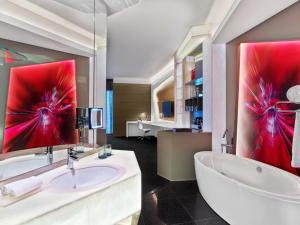 Featuring views of the Dubai water canal and the city, this 449 sqm suite offers free WiFi. It includes a separate spacious bedroom with a king bed, a large living room centered around a bar, adjoining majlis style lounge, kitchenette, tea & coffee facilities. The en-suite bathroom is fitted with a large spa bath, steam room and a walk-in closet. 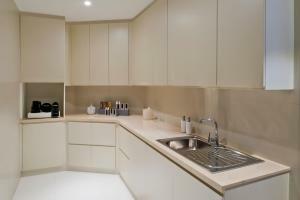 Featuring views of the Dubai water canal and the city, this 690 sqm duplex 2 bedroom suite offers free WiFi. It includes a lower level that includes a lounge and living room, wine chiller, runway stage, kitchenette and the master bedroom with a large round bed and en-suite bathroom with bathtub, rain shower. The upper level includes second bedroom with king-size bed, adjoining lounge area and en-suite bathroom featuring a steam room, bathtub and rain shower.